Researching the effectiveness of management techniques for controlling invasive Phragmites is incredibly important given the huge amount of money spent annually on trying to eradicate this invasive plant. It is estimated that current cost of control projects in Ontario ranges between $865 and $1,112 per hectare (Ontario’s Biodiversity Strategy, 2012) and that land managers in the United States spend over $4.6 million per year restoring habitats impacted by Phragmites (Hazelton et al., 2014). It is equally important to understand the effects of treatment. There are many methods of control. At Georgian Bay Forever, we work with communities in wetlands with a selective cut method. There are no approved herbicides to use in and around water in Ontario; although there are legal options in the United States that are widely used to combat invasive Phragmites. At GBF, we want to protect the ecosystems, and feel it is critical to strive to find research, and support projects to further understand methods and their effects in order to "do the most good, with the least amount of harm". 1. To isolate the mechanisms of competition Phragmites uses to displace resident wetland plants Carex (sedge), Calamagrostis (grass), Typha (cattail). 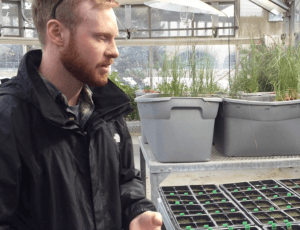 This is accomplished by coupling a greenhouse experiment with a field experiment to tease apart the relative importance of above ground competition (shading) vs below ground competition (nutrients) between Phrag and resident species. Field experiments involve selecting plants growing in competition with Phrag and assigning them to either a “cut” or “no cut” treatment – “cut” will have a 1 m2 area around the plant cut, so no above ground competition through shading takes place – and “no cut” has no above ground amendments. Since the target species are capable of clonal subsidy through below ground structures, all treatments had an area around the chosen plant severed to 50 cm to cut off below ground interactions and isolate above ground competition. Within the UW greenhouse, the importance of above vs below ground competition will be clarified in a more controlled setting. Using an additive design, Phragmites australis, Typha, and Calamagrostis will be grown in pairwise comparisons at densities to encourage competition. Partitions will be applied to isolate below ground interactions by restricting the interaction of roots and rhizomes, and preventing soil water from moving between root systems. Above ground competition will be controlled for using above ground partitions that hold shoots away from the target plant, preventing shading but not affecting ambient light. 2. The second research objective is to characterize Phragmites’ effect on bird communities. To do this, there are 48 point locations on Long Point that were visited 4 times during the breeding season, from early May until early August. Surveys began half an hour before sunrise, and all birds observed or heard within a 25 m, 360° radius from the center of the point count were recorded. Birds outside of this diameter, or flying through, were recorded but not used in further analysis. Sites were assigned to treatments based on dominant vegetation type – Phragmites, Typha, marsh meadow – and situation – interior, 50 m from a different vegetation type, or edge, within 50 m of a different vegetation type. Another treatment, open water, was added as Phragmites is capable of filling in important open water habitat within the marshes. There were a total of 6 sites within each treatment, giving us a balanced design this year unlike 2014 which was lacking in marsh meadow sites. The competition experiment is still ongoing, completion of the greenhouse experiment is anticipated for next fall. Territorial Scope: The restoration treatment study is confined to two sections of Crown Marsh where treatment plots are located, while the sand cap study is located on MNRF property north of Long Point Provincial Park. 1. The objective of Crown Marsh Restoration Treatment Study is to identify which of the chosen treatments (combinations of herbicide and mechanical methods) are most effective at eliminating invasive Phragmites while encouraging the regrowth of resident species in the resulting empty ecological niche. For the restoration treatment study, chosen treatments are as follows: 1) spraying herbicide, 2) spraying herbicide + simulated burning, 3) spraying herbicide + machine rolling, 4) simulated burning without herbicide spraying, and 5) machine rolling without herbicide spraying. There will be two control conditions also surveyed at each study location that to be used to compare the treatment effect. One will be located amongst resident species, and a second located in the stand of Phragmites. The herbicide is glyphosate based and at a 5% concentration. 2. The objective of the sand burial study is to determine the thickness (or depth) of sand cap required to impede the regrowth of Phragmites propagules. The findings of this project would be applicable to actors involved in the disposal or management of soil contaminated with Phragmites propagules. 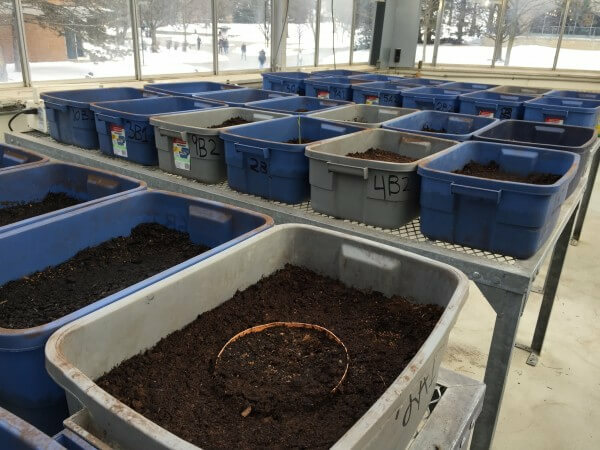 The sand cap burial study was designed using 10 mesocosms, each with a 20 cm layer of peat and Phragmites rhizomes, and capped with incremental depths of sand (0, 10, 20, 30, 50, 70, 90, 110, 130, and 150 cm). The mesocosms were buried with the top at surface level, and the peat mixture at differing depths. Mr. Howell provided this status report update on results to date on the Crown March restoration Treatment Study in this post, Chemical Control of Invasive Phragmites and the Seedbank. -More results are to follow. What are propagules? A portion of a plant that is sufficient to produce a new individual . Phragmites australis (European Common Reed) is an invasive perennial grass that is spreading rapidly throughout Ontario causing severe impacts within our communities and ecosystems. The Collingwood shoreline has been infested with Phragmitesover the past two decades. This infestation has driven community concern around shoreline aesthetics, shoreline access, property values and ecosystem degradation. One ecosystem in particular where Phragmitesis becoming an increasing concern is the west shoreline of Collingwood, Ontario. This shoreline hosts globally rare coastal marshes that are home to a diversity of species, including Species at Risk and is a part of the larger Provincially Significant Silver Creek Wetland Complex. Following an initial community stakeholder meeting in September 2014, Nottawasaga Valley Conservation Authority (NVCA) and Georgian Bay Forever (GBF) coordinated a community action plan for the West Collingwood shoreline and. In July 2015 NVCA received a grant of $29,039 from Environment and Climate Change Canada’s Lake Simcoe South-eastern Georgian Bay Clean-up Fund and GBF received a $50,000 grant from RBC Bluewater Project to assist the community with Phragmitesmonitoring, control and education. NVCA and GBF staff worked with community groups to map the extent of Phragmites in the study area in May and June 2015. A community training session was held in July 2015 prior to control efforts. 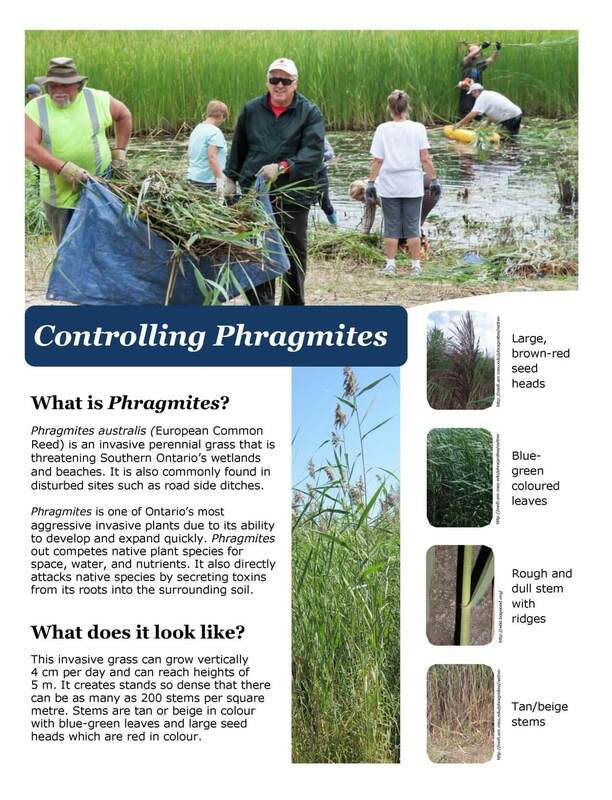 Control efforts in August 2015 engaged dozens of volunteers who contributed hundreds of hours toward Phragmites control. Follow-up monitoring was undertaken in fall 2015 to assess initial success of control efforts. Community outreach and education was an important component of 2015 efforts. Several fact sheets were produced by the NVCA/GBF team and Blue Mountain Watershed Trust reported on project efforts. The project was promoted by various media outlets and outreach to local nurseries and garden centres was undertaken. 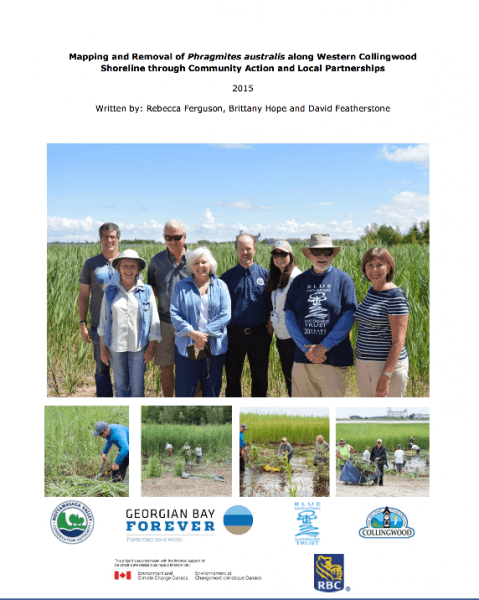 Following a successful 2015 effort, we will provide additional focus on Phragmites control on public lands in 2016 and look forward to adding another condominium association (Blue Shores) to our community partnership. We aim to make this project a long-term sustainable initiative in the Collingwood community through education and outreach, annual monitoring and large-scale cutting events on both private and public lands. Study purpose: Develop scientific methods for monitoring the effectiveness of herbicide spraying. Focus on the evaluation of effectiveness of past herbicide treatments on Phragmites, and post-treatment restoration response of vegetation and faunal biodiversity. Dr. Bourgeau-Chavez presenting, Remote Sensing Series Part I: Monitoring and Assessment of non-native Phragmites australis in terms of Habitat Restoration (authors: Laura Bourgeau-Chavez, Amanda Grimm, and Jason Carlson) on YouTube. *Mr. Colin Brooks presenting, Remote Sensing Series Part II: Field and remote sensing methods to inform adaptive management of non-native Phragmites on YouTube. Research: Webinar and powerpoint that focus on the special adaptations that allow Phragmites survival in deep water, and how it responds to changes in water level. Shoots act as snorkels for oxygen that work with other recent discoveries that about its gas transport that shed light on Phragmites ability to survive fluctuations in water levels (increased flooding) due to climate change. 1 hr. webinar: Phragmites snorkeling: How does it survive water level fluctuations? Powerpoint deck: Phragmites snorkeling: How does it survive water level fluctuations?.